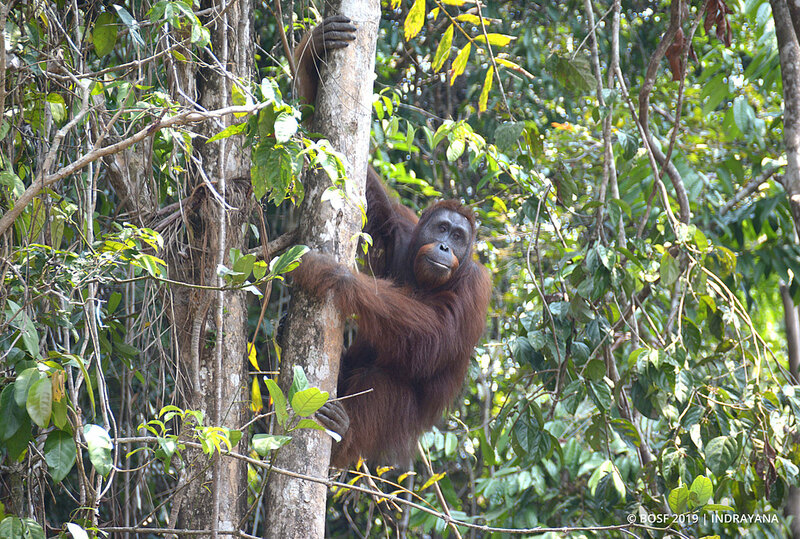 April 4, 2019 — The BOS Foundation’s Post-Release Monitoring (PRM) teams conduct daily monitoring and behavioral observations on released orangutans, to monitor and evaluate their adaptation to their new forest homes. Our PRM team from the Lewun Kahio Monitoring Post in the Bukit Baka Bukit Raya National Park (TNBBBR) is happy to report that the recently released Paijah, Rosidin, Danida, Tristan, and mother-infant pair, Buntok and Borneo, are all adapting well to life in the National Park. On her first day in the forest, Paijah spent a lot of time resting in the canopy as she scanned and assessed her new surroundings. At around noon, she started to move around and actively forage, and finished the day by building a night nest. During the first week, she was seen bumping into Rosidin, a 20-year-old male, but we haven’t seen any attempts at mating yet. 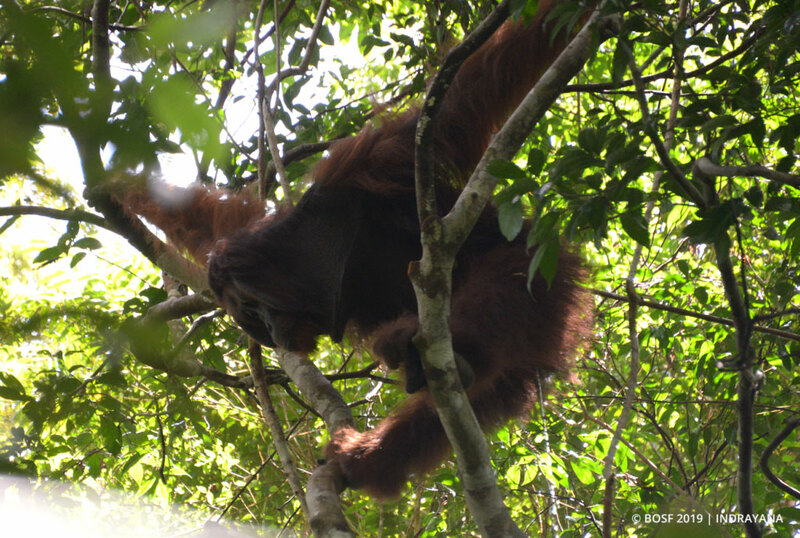 When his cage was opened, Rosidin quickly moved away from the release point and climbed straight up a tall tree. The semi-wild male easily navigated the trees and appeared to be thoroughly enjoying his freedom, feasting on leaves and shoots. He built a nest in a particularly tall tree, and stayed in the area for the first three days. 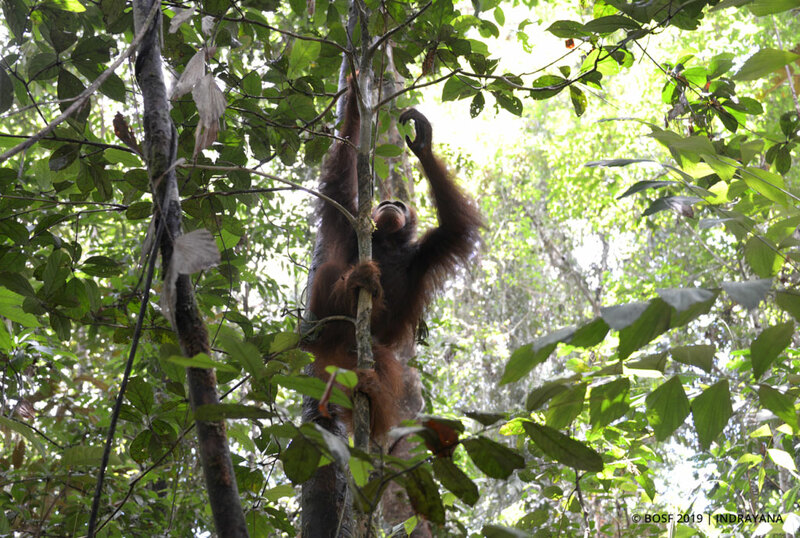 Unlike Paijah, who chose to rest after the long journey from Nyaru Menteng, Danida set off to explore her new environment from the very first day she was released in the forest. She moved swiftly from one tree to another, taking in the atmosphere of her new playground! 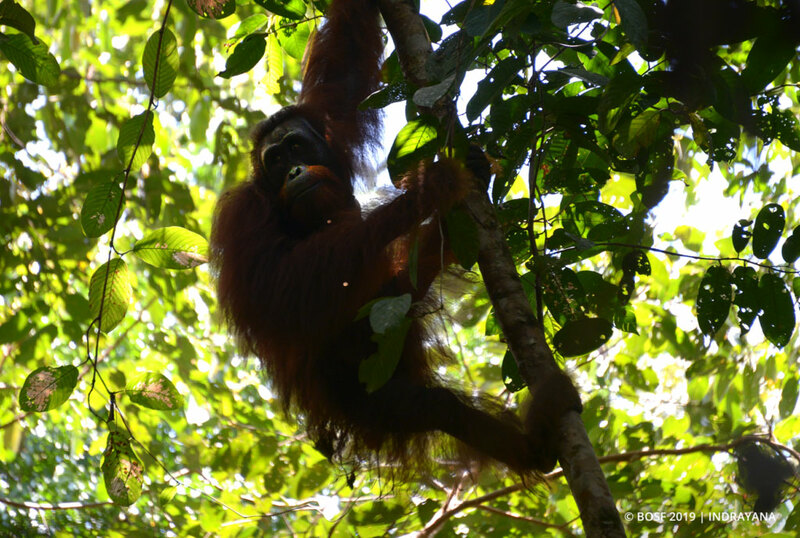 She kiss-squeaked every time she spotted our PRM team members on the forest floor below, voicing her displeasure at their presence. Danida started to seriously forage in the afternoon and was seen spending time with Tristan. The PRM team was pleased with Tristan’s movements post-release. 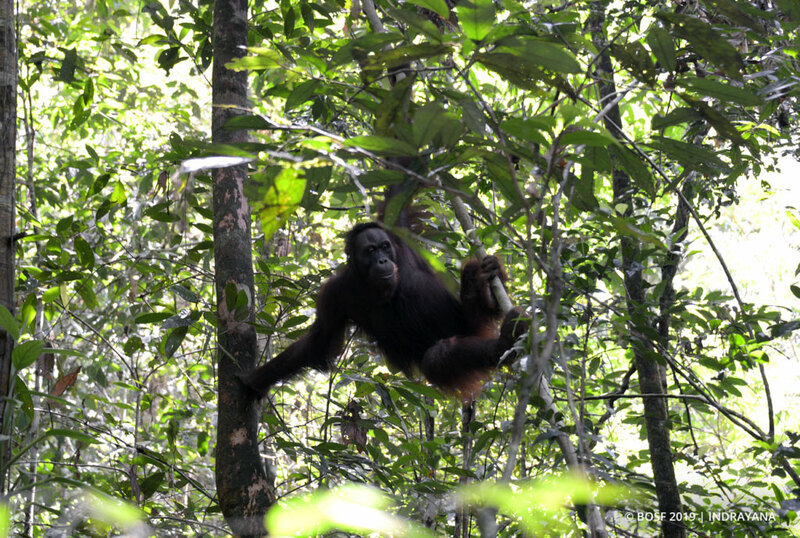 He actively moved around in the canopy as he tirelessly explored the forest, foraging along the way. He was seen taking breaks and resting on branches, and looked to be enjoying his first day of true freedom. 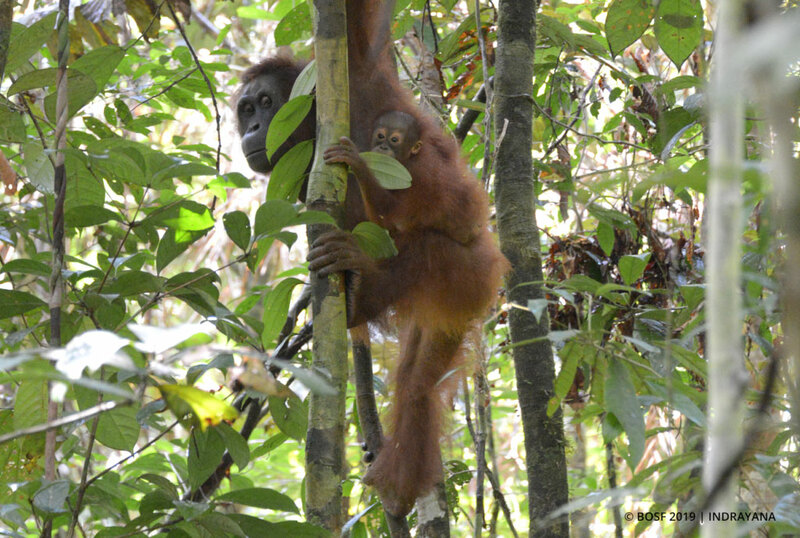 During the first week of observations, mother-infant pair, Buntok and Borneo, quickly got into a natural routine. Mother Buntok actively foraged for a wide variety of forest food, while son Borneo taste-tested some of the new foods on offer. We are delighted to learn that these six released orangutans are adapting well to their new forest home and living the good life. This is a fantastic start for them – to live as true, wild orangutans that will hopefully create a new and viable orangutan population in the future!